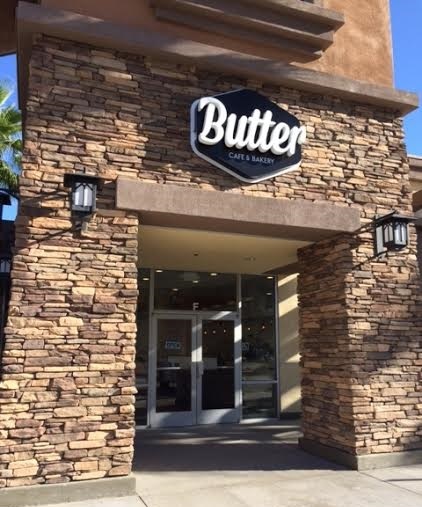 Butter Cafe and Bakery, 671 E. Bonita Ave. (at San Dimas Canyon), San Dimas; open daily, 8 a.m. to 7 p.m. Sorry, I had to say it. 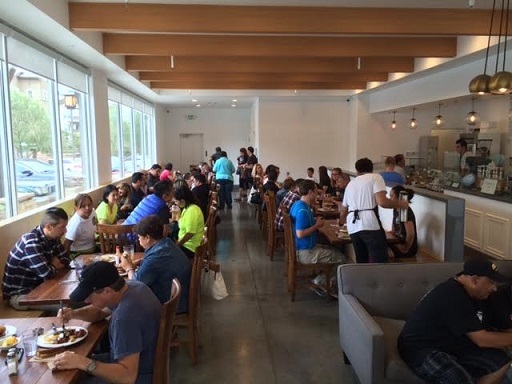 I’ve eaten at Butter five times so far and have enjoyed each visit to varying degrees, Butter being something the valley is perennially short on: smart, artisanal eateries. 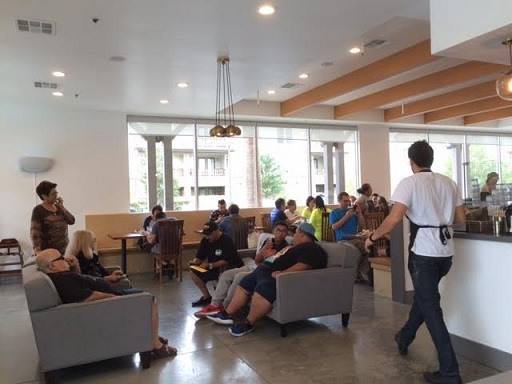 The menu has baked goods, coffee, breakfast dishes, salads and sandwiches. 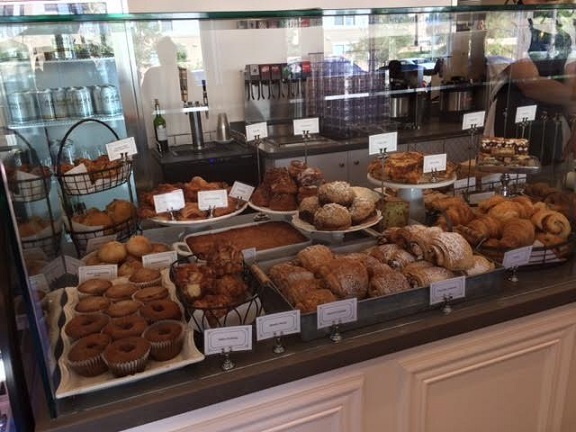 The display of baked goods — muffins, scones, croissants, cookies and more — is enticing. 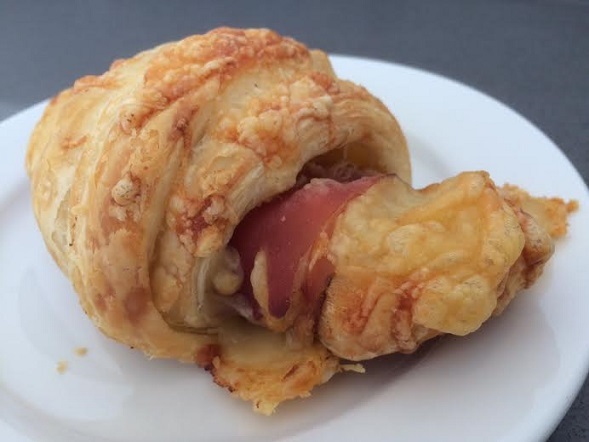 On my first visit I had the prosciutto and gruyere croissant ($4), a good knife and fork item. I’ve also taken a cinnamon roll ($2.75) to go; it was icing-free and perhaps not yours, or my, idea of a cinnamon roll, but it was good anyway. 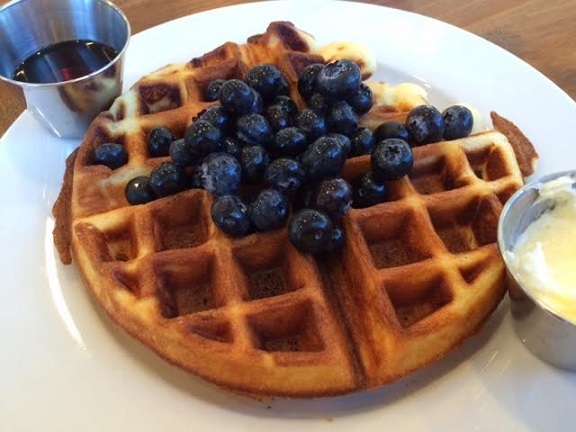 My first sit-down visit, I had a waffle ($6) with fruit ($2), in this case blueberries. Nice, but it took a frustrating 20 minutes to arrive. Butter can get busy. At high noon on a Sunday, all the tables were filled and so were the two bars with bar stools and the comfy sofas. But I found a spot at the bar (I hesitate to say counter, as it’s just a shelf, not like a diner counter) and by 12:30 there were several open tables. Plan your visit accordingly. The interior is a little stark, but the wooden tables and benches add a natural touch. 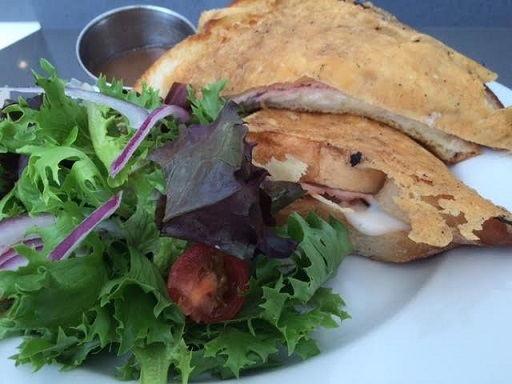 That time I had the croque monsieur ($10) with a small salad. Very good. This was off the brunch menu, but it turns out you can order off the regular menu too. I came in for an early dinner one night — remember, they close at 7 — and was the only customer, other than a couple of people who came in for to-go orders. Plenty of seating. 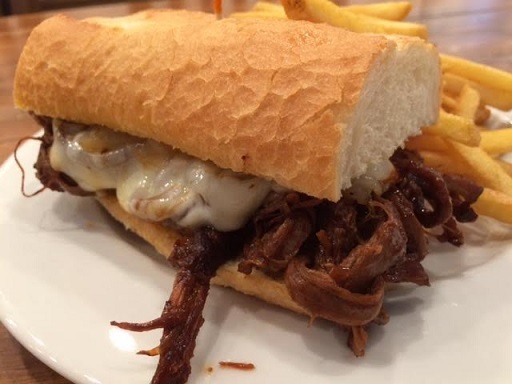 I got the brisket sandwich ($11), one of Butter’s signature items, made with Harris Ranch beef. It didn’t wow me, although it was good enough; the beef’s denseness made it awkward to pick up and eat, and not easy to cut up with a knife and fork either. The fries were bland. I expected better. On Tuesday I went in for lunch with a friend. 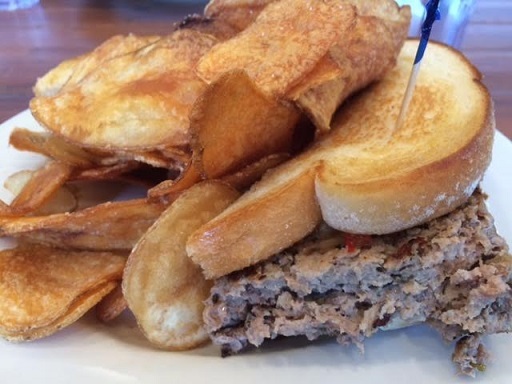 I had the meatloaf sandwich ($10), very tasty. The tomato jam spread was a little sweet for my taste. The chips were housemade and no more interesting than the fries. Well, tater tots is the third option as a side. I’ll try them in the future. Why not a little salad or fruit? Oh, and while my friend’s salad (below) arrived almost immediately, my sandwich took 15 awkward minutes and a worried inquiry from the staff about what I’d ordered. As that’s happened two times in five visits, maybe there’s an issue in the kitchen. 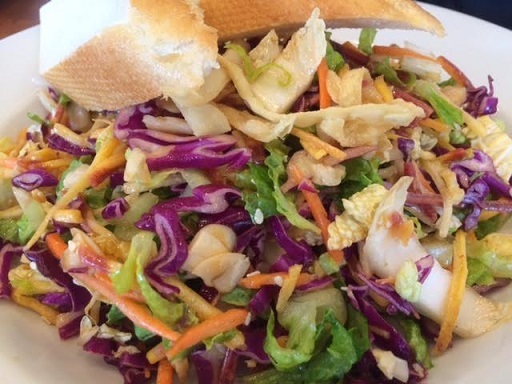 My friend had the Asian salad ($9), said it was good but wished the plum dressing were tangier. He could have added chicken for $3 and thought that would have been a good choice. Butter seems to be establishing itself and I hope they continue to do well. I’m sorry the Fresh and Easy that anchors the center is closing, but Butter is building a clientele that should keep coming. I’m looking forward to more meals there myself. 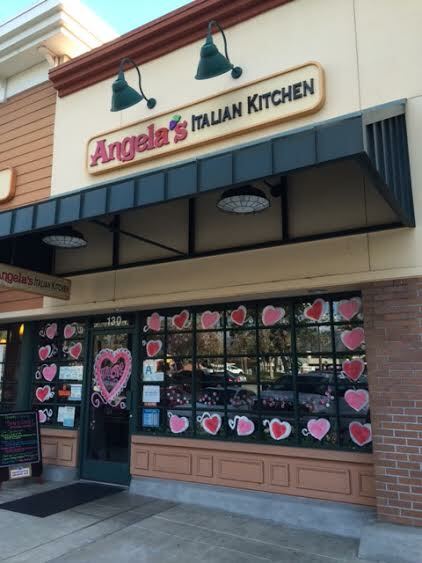 Looking for somewhere to eat in San Dimas, I found Angela’s on Yelp and invited a friend to meet me for lunch. It’s on the main drag, only a block east of another Italian spot, Pozzetto, where he and I ate last year. Angela’s is in the Albertsons center, toward the west end. It’s so small, your first sight as you walk in is the door to the women’s room. But after that, they’ve managed to make the dining room feel cozy, not small. The dark wainscoting and tan paint help, as do the plethora of decorations, which include many Sinatra posters. 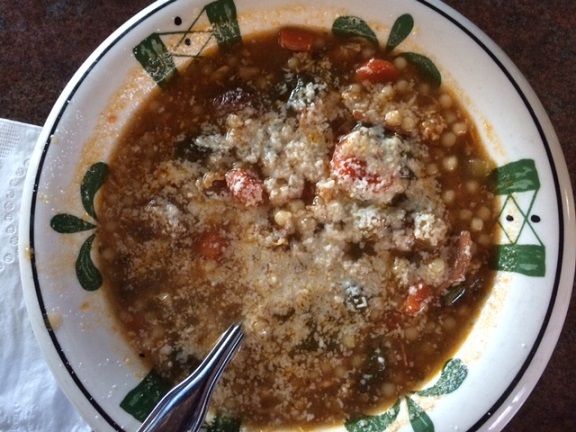 Rather than salad, we each ordered Italian wedding soup as our side (pictured below); full of pasta, spinach and meatballs, it was very good. 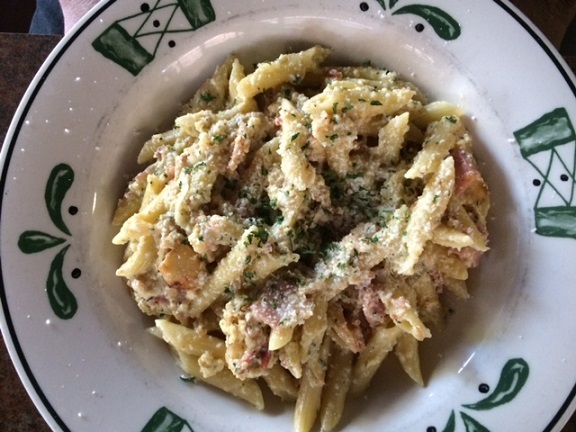 We each got pastas: pasta carbonara (“good consistency and flavor,” my friend opined; pictured second) and baked mostaccioli (maybe too much cheese, but good; pictured third); each was $16. I took home half of mine and got a second meal out of it. Did we like Angela’s or Pozzetto better? Based on one meal at each, it’s Pozzetto by a nose, and note too that Pozzetto is larger and has a wine bar. But there’s nothing wrong with Angela’s. 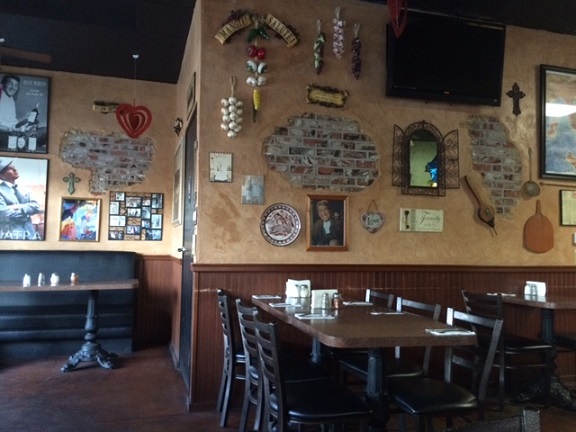 A friend recommended Pozzetto, an Italian restaurant in downtown San Dimas. 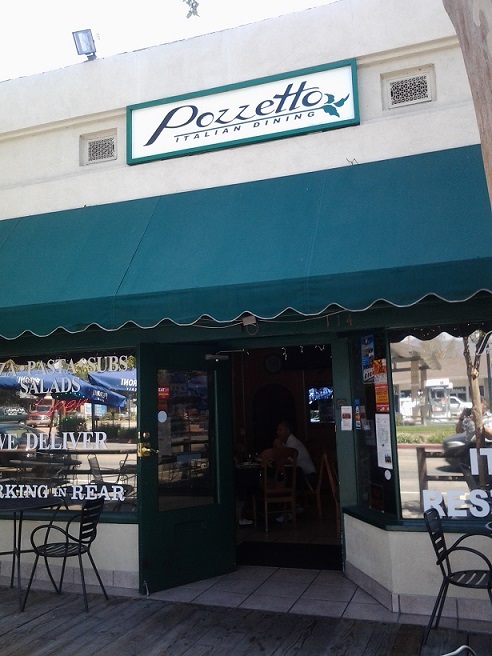 I know and like the main drag of San Dimas, but I didn’t know Pozzetto. So recently I met a different friend there for lunch. Pozzetto is small but cute, with a couple of outdoor tables along the wooden-sidewalk promenade and a few more inside. 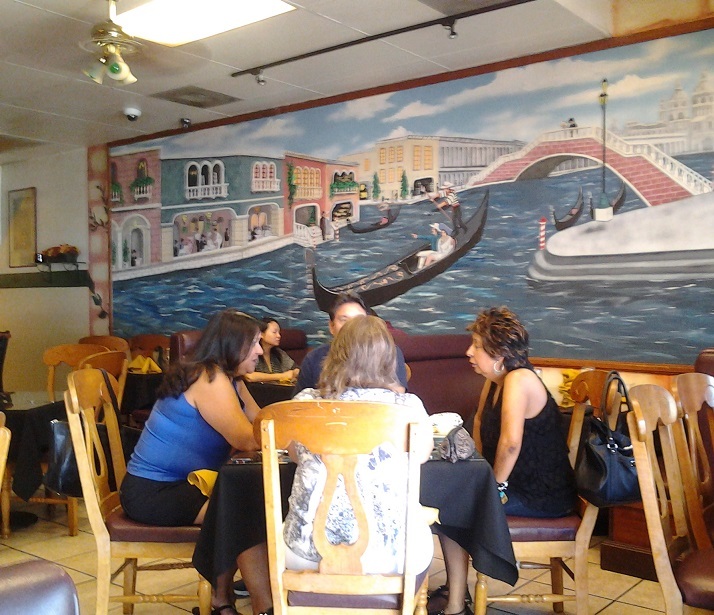 There’s also a wine bar and a mural of Venice sprawling across much of a wall. 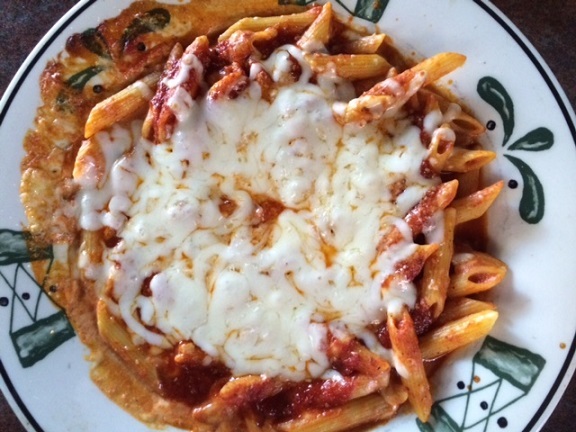 Pozzetto has all sorts of Italian items — salads, sandwiches, a dozen pastas — with only five pizzas. I got one of the pizzas, whose name I forgot and which I can’t find online. 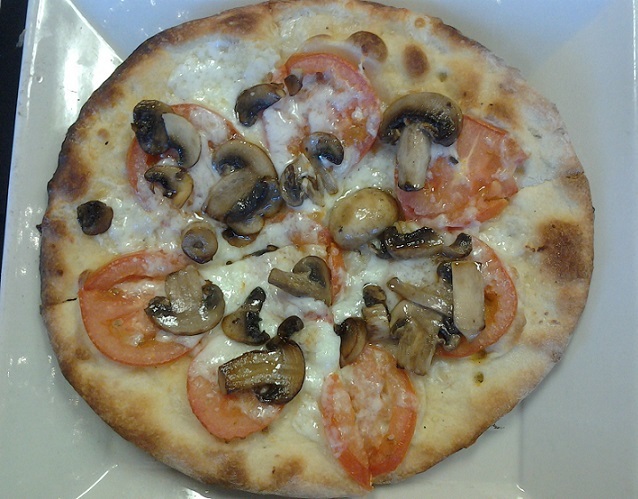 All are Neapolitan style, a more traditionally Italian pizza; mine had tomatoes, olive oil, mozzarella and garlic ($10). It was a good lunch-sized pizza and I ate it all. My friend had a roast beef sandwich ($7.50), served warm on a roll. He liked it and shared a portion with me. 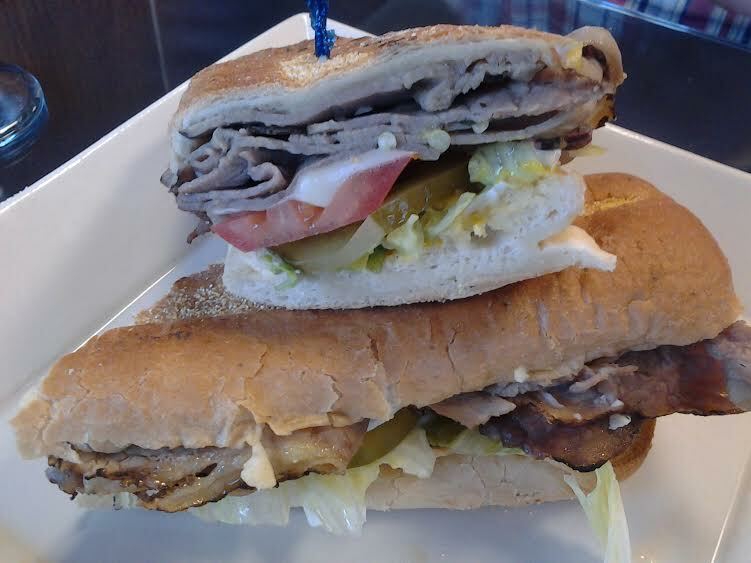 I’m not a big roast beef fan but I would consider ordering this sandwich myself. Service was brisk; the lone server was handling about five tables by himself, but he did the best he could. All in all, Pozzetto was a pretty decent mid-priced Italian spot. Thanks to my first friend for the recommendation and my second friend for joining me.